Microscope Imaging Station. 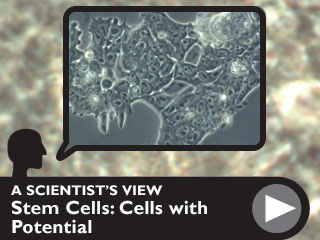 Stem Cells: Cells with Potential. Hear stem cell researcher Bruce Conklin explain why this science is important and what it's like to watch newly grown heart cells beat in a culture dish late at night. Your body contains over 200 types of cells, each with a specific job: blood cells carry oxygen; muscle cells contract so that you can move; nerve cells transmit chemical signals. The job of a stem cell is to make new cells. It does this by undergoing an amazing process�differentiating, or changing into another type of cell. Each time a stem cell divides, one of the new cells might remain a stem cell while the other turns into a heart, blood, brain, or other type of cell. In fact, stem cells are able to divide to replenish themselves and other cells without any apparent limit. Stem cells are the source, or �stem,� for all of the specialized cells that form our organs and tissues. There are many kinds of stem cells, but two types have made frequent appearances in the news: embryonic stem are present in very early—and very tiny—embryos, and produce the first cells of the heart, brain, and other organs. They have the potential to form just about any other cell in the body. Adult stem cells are found in many tissues of developed organisms, and even in embryos after they�ve begun to grow (A newborn baby�s body contains adult stem cells). They�re also found in the placenta and umbilical cord. Adult stem cells can replenish some tissues lost through normal wear and tear or injury. However, adult stem cells are only able to generate a few specific cell types. Adult stem cells in bone marrow, for example, make new blood cells, and adult stem cells in the skin make the cells that replenish layers of the skin.